Hey Lady! Do yoo finks yoo can turn da heat on? It's gettin a little chilly here in Connecticat. We knows da heat is aposed to come owt of dis silly fing on da floor cuz it did beefor. So can yoo make it werk? Can yoo, can yoo? Schmaybe dis is a good reesin to go to TAMPA! We heer it is warm dare. 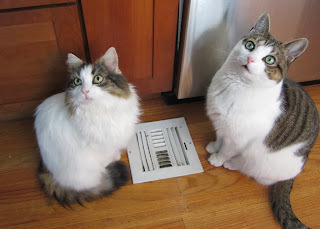 We likes da heat. Finks about it ok?